SATURDAY, JUNE 1ST FROM 9:00 A.M. TO 6:00 P.M.
Osawatomie Saturday, June 1st of this year! for 12 kids right here in Osawatomie to race in that day! less - it just means more weight in the car! $2.00 raffle tickets can be purchased at the following locations beginning Monday, April 1st: Auten Pharmacy, Chris’ Cafe, Donna & Viola’s Shirts, First Option Bank, Landmark National Bank, Pat’s Signs, Palace Hardware, City Hall, the Osawatomie Public Library and of course the Chamber of Commerce Office! The drawing, along with instructions will be announced at the Chamber of Commerce Business Expo on Saturday, April 20th. If your name is drawn, you have won your chance to race down Main Street on Saturday, June 1st and will owe NO extra fees on race day! Your car, weights and a swag bag will be provided that day! We hope you will take this opportunity to join in this very unique opportunity. 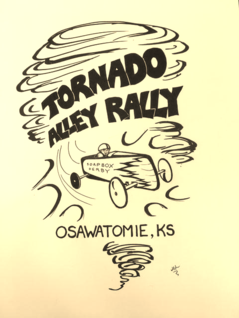 We will be the only City in the state of Kansas privileged to have a Soap Box race so we hope to have your support this day! If you have any questions, please feel free to contact the Osawatomie Chamber of Commerce at (913) 755-4114 or via e-mail at chamber@osawatomiechamber.org.